A memorial garden has opened in Maidenhead, Berkshire, to commemorate a First World War Victoria Cross winner. 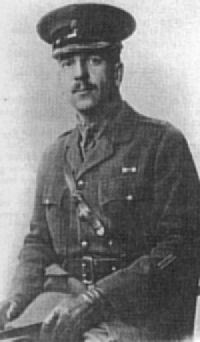 Captain Thomas Tannatt Pryce (32) of the Grenadier Guards, was reported missing on 13 April 1918 after a fierce, close-quarter battle with German troops at Vieux-Berquin in France. Captain Tannatt Pryce was born in The Hague, Holland, but lived in Gringer Hill, Maidenhead. Prior to entering the army he worked in the City of London and he served initially with the Honourable Artillery Company and the Gloucestershire Regiment prior to transferring to the Guards. He had already been awarded the Military Cross. His VC citation states he won the gallantry medal for, ‘most conspicuous bravery, devotion to duty, and self-sacrifice’. It adds that the officer had led two platoons of guardsmen to attack a village, where they had killed more than 30 enemy soldiers. The following day, however, the group faced a number of intense counter-attacks. By the evening only around 17 men were left out of the original force and these were very low on ammunition. Tannatt Pryce was last seen, ‘engaged in a fierce hand-to-hand struggle with overwhelming numbers of the enemy’. His body, like those of many of those under his command, was never found. His name is inscribed on the Ploegsteert Memorial to the Missing. His VC is on show at the Guards Museum in London. This entry was posted in Events and tagged 1914-1918, 1918, First World War, news, VC, Victoria Cross, WW1. Bookmark the permalink.